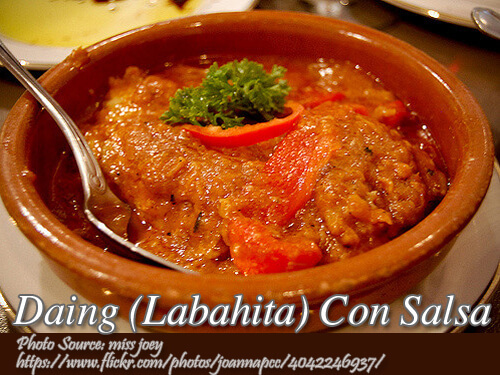 This daing na labahita con salsa recipe is a counterpart and local version of the popular Spanish dish called Bacalo a la Vizcaina. Compared to the pricey dish, this recipe uses sun dried and salted labahita or surgeon fish which is cheaper than the dried codfish which is usually imported. To cook daing na labahita con salsa; Soak daing in 3 cups water with 1 Tbsp. vinegar for 15-20 minutes. Change vinegar solution 3 times. Drain. Boil daing in 3 cups water for 10-15 minutes. Drain. Saute garlic, onion, potatoes and green peas. Add tomato sauce, daing, laurel leaves and 1 cup water. Season with salt, sugar and pepper according to taste. Add green onions just before serving.